We've heard some questions about the promotional goodies that we often include when you order from Warehouse 23. We're standardizing our procedures to make sure that every fan gets a reasonable amount of swag in an order. Going forward, this is our policy for including promo items in Warehouse 23 orders. While supplies last, every order including at least one physical product gets one 2014 Munchkin Silver Piece. 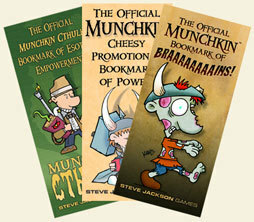 You may get free Munchkin promo cards and Munchkin bookmarks, too. (Sometimes, we may have non-Munchkin goodies as well!) As a general rule, larger orders are more likely to get more stuff. Our supply of promo items changes frequently, so unfortunately we cannot fill specific requests for promos. You'll sometimes see other special promotions on Warehouse 23. Those goodies are in addition to anything mentioned in the above list. Enjoy your swag!